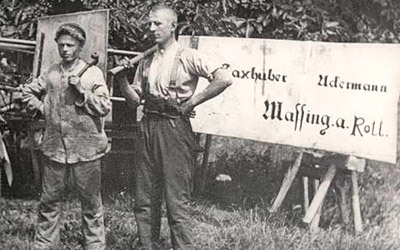 Formation of a locksmith and plumber shop by Stefan Laxhuber and Josef Ackermann in the outhouse of the then Laxhuber inn. Especially wind turbines for the water and power supply of the individual farms buildings were produced. After the founders had separated in 1926, each of them built up his own company. Stefan Laxhuber specialised mainly in agricultural machines. Already in 1928, he sold the highly marvelled first tractor of this region. 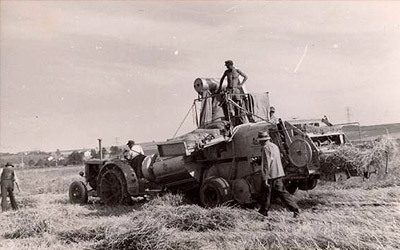 Reaper-binders and threshers with steam boiler drive were further focus points in the agricultural business of the early thirties. The young entrepreneur ranks among the pioneers of the new harvesting technology. 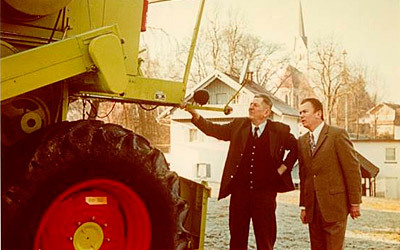 Already in 1937, he can deliver the first Claas combine. A hall to store agricultural machines is built. The reconstruction and consequently the mechanisation of agriculture interrupted by the war starts slowly and gradually. The existsing workshop is expanded by a extension. The main focus of the company now is the trading with Claas combines. The 250. new combine is delivered. The first dryer for grain and maize is constructed. 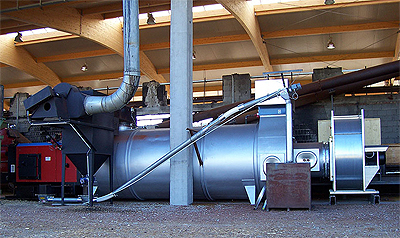 It is a flatbed dryer with feed-and-turn system, still up to date today, under the brand mark STELA. From now on, the slow but continuous change from the pure trading of third-party products to the manufacturing of own products starts. The one-man company Stefan Laxhuber is transformed into a limited partnership. 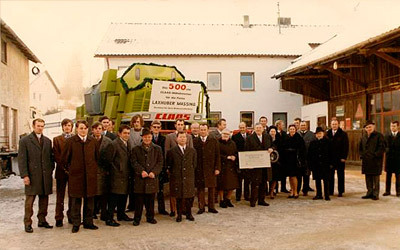 On the occasion of the 50th anniversary of the company, the founder Stefan Laxhuber committed the company to his son. The 500. new Claas combine was delivered. 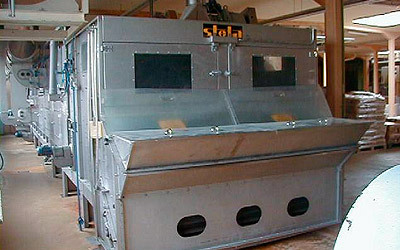 The following years, there are many changes and improvements in the drying technology. The plants become bigger and more powerful. With the first belt dryer for drying food, a field beyond agriculture can be developed. Maize threshers especially developed to harvest grain maize are imported from France. New construction of a production hall. The food and industrial sector increasingly count on the know-how of the leading drying specialist all over Europe � the company STELA. An independent company for control systems is founded. This means another important step to improve clout and service. The more and more complex regulations and requirements concerning the control engineering of the dryers can now be fulfilled at first hand with full know-how. The era of computers for manufacturing dryers starts. The plants are constructed by means of CAD and manufactured on CNC machines. The production hall is enlarged. A welding robot completes the high technical standard in production. 120 dryers a year on average leave the factory. The STELA products are sent to all continents. We move into a new administration building. The workplaces are equipped with the most modern computer systems and are linked among one another. The 75 year jubilee was a raving success. Meanwhile, more than 2000 drying plants are in operation all over the world. The opening to the East provides new sales opportunities for the future. STELA Laxhuber GmbH now is the leading European manufacturer of belt dryers for food and industry. A further new production hall and showroom is built. The first sawdust dryer for the pellet industry is supplied. This is the beginning of the success story up to the market leadership for dryers in the pellet production. Construction of the first maize dryer throughout the world with wood chips firing. Development of dryers for waste heat recovery from biogas plants. Here belt dryers are used which can dry the produced digestates by means of the waste heat from the biogas plant. The 1000. feed-and-turn-dryer is delivered. This type of dryer has been up-to-date for more than 40 years now. Particularly for the waste heat recovery from smaller biogas plants from 300 kW on, this system has proven itself today. Especially the new ventilation (exhaust fan is installed at suction side instead of high-pressure side) is highly successful. Compared to the conventional solution, the electric energy consumption decreased by almost 50 % with nevertheless excellent emission values. Expansion is proceeding widely despite the economic crisis. The first and biggest STELA dryer ever produced is delivered to New Zealand. In Europe, the markets in Scandinavia and on the Iberian Peninsula are brought into focus more and more. STELA succeeds in boosting its market shares as the customers, despite the crisis, are convinced of the high manufacturing quality.